Magnum 340 and 400 Flint are touring-friendly porches, which are quick to put up when you’re on the go. 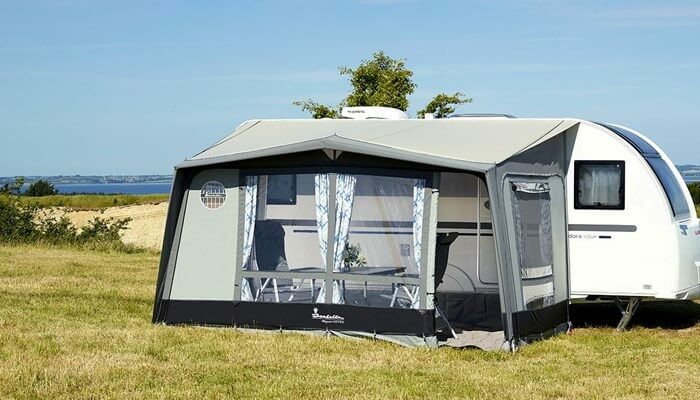 With Magnum 340 or 400 Flint, you get a spacious touring awning with a depth of 2.5 metres and a width of either 3.4 or 4 metres. 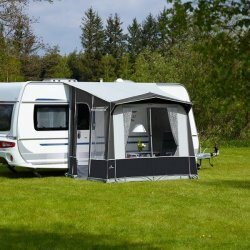 If more space is required, inside or out, Magnum 340 and 400 Flint can be extended with an Eclipse front sun canopy (specially designed for Magnum), Cosy Corner (specially designed for Magnum), and an annex giving you an extra bedroom or additional storage space. Magnum 340 and 400 Flint are made of Isacryl, which ensures a good indoor climate. Magnum Flint is part of the Flint style concept, i.e. a greyish colour scheme inspired by flint as a material. Read more about the Flint style concept. Comes as standard with: Collage Blue curtains, wheel arch cover, draught skirt, side veranda pole, FixOn, awning bag, pole and peg bags including peg remover. Special features: Extra long roof wings for additional strength and optimal fit, full length canopy providing extra shelter, mosquito net in both sides. Ventilation in the front. Large front window. Optional extras: Annex 250, Cosy Corner II special, Eclipse FSC special, Net Front Panel, Net Side, veranda pole and support pole (400), storm securing set. Distance between roof poles 340: 313 cm, 400: 382 cm.